Not only is Memento a great place to shop, but it is also a great place to work. We are the seven leading ladies in a little production called Memento. There are a few things the women of Memento do to maintain a super fun work environment. For one, our iPod is always set to Pandora. We dont whistle while we work, we rock out. Not a day goes by where someone doesn't burst into song and dance. All of us frequent Pinterest in search of creativity and inspiration to keep our minds fresh and fun. Everyone has their favorite boards but we all have one in common, Monograms. One of our favorite stories to tell is how we ordered blue shirts and were trying them on to check sizing. We looked like a band of mechanics fresh from the shop. That's when we decided to give ourselves mechanic names. As you can see, we are just a bunch of girls who have found a fun way to offer our customers the best service and quality products in the industry. The map below shows where Memento has sold product. Our resolution this year is to extend our front porch to more places on the map. 1. An item that serves to remind one of a person or past event. 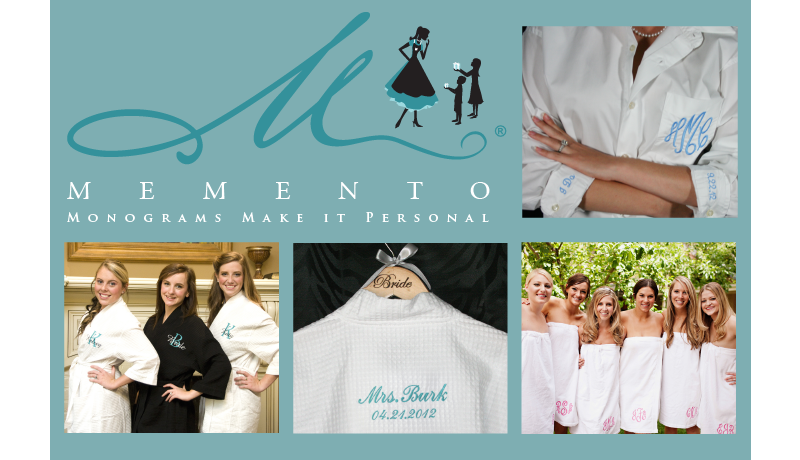 Memento creates gifts that are as unique & special as the person receiving the gift.